My name is Ann Wright, and I’m a retired Army Colonel and diplomat who resigned after 16 years in the State Department in opposition to President Bush’s illegal and immoral invasion of Iraq. I’m also a proud member of CODEPINK, an organization that makes incredible waves with just a few on staff and lots of dedicated volunteers like me. This holiday season, please consider making a gift to CODEPINK. Your support helps us hold elected officials accountable, support brave whistleblowers, lead international peace delegations, and so much more. Also this year, CODEPINK brought over 300 peace ambassadors to Cuba to learn how diplomacy can work. In November, we traveled to Guantanamo for an international summit to abolish foreign military bases. We're thrilled that in 2015, Cuba was taken off the US state terrorist list and embassies were opened in both Havana and Washington DC. In the new year, we are dedicated to shutting down the US prison in Guantanamo and returning the naval base to the Cuban people, lifting the travel ban, and ending the embargo. In February and in May we’ll be going back to Cuba to expand our Local Peace Economy campaign. It’s not too late to sign up for one of our trips today! 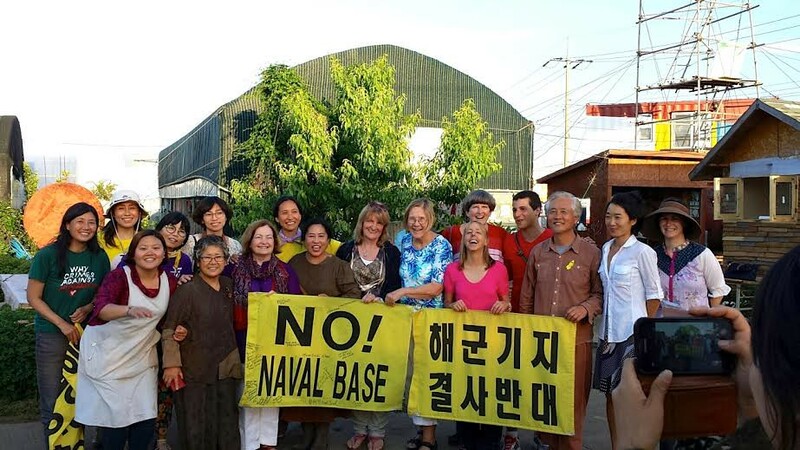 In May, CODEPINK co-founders Medea Benjamin, Jodie Evans and I joined WomenCrossDMZ, the first-ever international women’s peace walk from North Korea through the demilitarized zone into South Korea. Now we are part of a new national coalition for peace and reconciliation on the Korean Peninsula. We visited Jeju Island (pictured above!) to meet with activists resisting the US military presence on the island. Just last week I returned from a delegation to Okinawa, Japan to oppose the destructive expansion of the US base there. Next year, join me for a CODEPINK delegation to Okinawa. Stay tuned for how you can apply to join! But our work for peace is only possible with your support. Please consider making a donation today to help us continue our work for a more peaceful world in 2016. PS: Feeling down about 2015? Lift your spirits and check out Medea's latest, 10 Good Things About the Not-So-Good Year 2015.